Summertime distractions have kept me from updating this blog for the past few weeks. Here is an entry to get things rolling again. 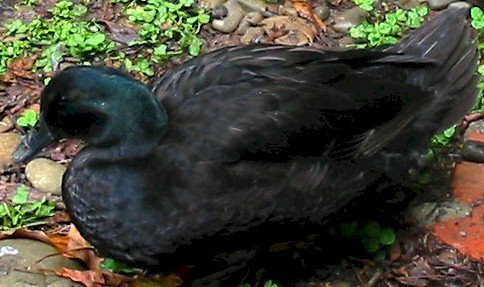 Dixie and Louis, our pair of Cayuga ducks, are now (almost) fully grown. I have found photographing black ducks to be a bit of a challenge. The background must be carefully chosen, else they seem to appear as little more than dark blobs in the photo. Here is a photo of Dixie flapping her wings. 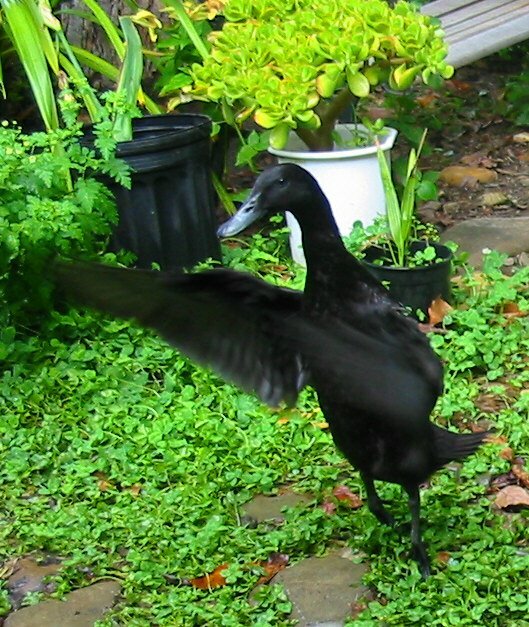 Dixie has never really taken flight, but she loves to stand on tip-toes, furiously flapping her wings. She bounces up and down as if on a pogo stick. Louis, on the other hand, has actually flown short distances. Louis is larger than Dixie, and his wings are more fully developed, but I have yet to catch him in full flight with the camera. Here is Louis, waddling about near one of their watering dishes. Some of the green iridescence is clearly visible on Louis’ head. In addition to their watering dishes, the ducks have a wading pool in which they can splash about and go for short swims. 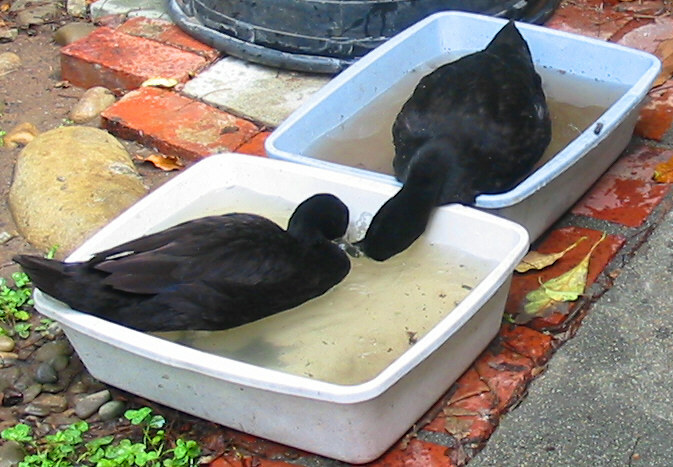 Here is a photo of them in a couple of their watering dishes. Louis, in the blue dish, is “helping” Dixie wash a munchie of some kind. Yes, they spend quite a bit of time in their watering dishes (which are plastic dishpans). The ducks seem to prefer their drinking water to be “seasoned” a bit before drinking it. Their duck house, duck pen, and water facilities are works in progress; they enjoy full access to the garden in rear of the house until such time as I have finished fencing “their” territory. We were concerned that the ducks might destroy the plants in the garden, but they seem to be mostly carnivores, and do virtually no damage to the plants while searching for munchies hidden by the foliage. Snails, slugs, and earthworms are their favorite food. They will eat store-bought food that is formulated especially for ducks, but only as a last resort when they can’t find enough “real” food to satisfy their appetite. These guys are excellent foragers! This entry was posted in Pets and tagged cayuga ducks, ducks. Bookmark the permalink.